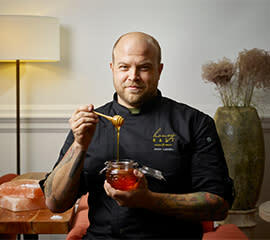 Jason Labahn serves as the Executive Chef of Honey Salt at Parq Vancouver, an international hospitality, culinary, and gaming destination in the heart of Vancouver’s downtown entertainment district. Having served in the role since July 2017, Chef Labahn was instrumental in the design and execution of the Honey Salt menu. A Nashville, Tennessee native raised in Orlando, Florida, Chef Labahn joined Blau + Associates following two successful stints with Glowbal Restaurant Group -- from 2016 to 2017 as Chef de Cuisine for Vancouver’s Black and Blue Steak House, and from 2011 to 2013 as Executive Chef for Black and Blue and The Roof. In between, Chef Labahn served as Corporate Executive Chef for Browns Restaurant Group from 2013 to 2016, a role that saw him overseeing menu engineering and product development for the organization’s 55+ locations across Canada and the United States. Chef Labahn acquired much of his experience as an Executive Chef and Executive Sous Chef in Las Vegas, Nevada. From 2003 to 2010, he successfully opened Chef Jose Andres’ critically acclaimed and internationally recognized Jaleo at The Cosmopolitan of Las Vegas, Light Group’s Brand American Steakhouse at the Monte Carlo and Stack American Steakhouse at The Mirage, Wolfgang Puck’s café at the Las Vegas Springs Preserve, Alex Restaurant at Wynn Las Vegas, and FIX American Steakhouse at The Bellagio. Reflecting on his experience, Chef Labahn credits much of his success to his desire to never stop learning about his craft and to keep his focus on customer service. These qualities serve him well in his role at Honey Salt, in which he executes a menu of regional cuisines derived from sustainable and seasonal ingredients. Chef Labahn graduated from Florida Culinary Institute in 1999 with an Associates Degree in Culinary Arts. He served three years as an instructor for Le Cordon Bleu, and has spent several years as a culinary consultant, assisting restaurant groups and chefs with everything from staffing to kitchen and menu design. What three words best describe your cuisine? What is an absolute must try on your menu for the upcoming festival? For lunch - our famous Biloxi Chicken Sandwich. It’s sweet, savory and crunchy! For dinner, the Organic Crab Stuffed Salmon, its a favorite of mine and represents what is local and sustainable in BC. What is your favourite “tourist in your own town” activity? The Vancouver Aquarium and Science World are two go-to spots for me…but I have a 3 year old. If you don&apos;t have a kiddo, hit Main Street for a pub/snack crawl and finish out in Gastown for more fun!